For the next two years, your two authors will feature a number of posts about the remarkable Breckinridge family, a family which, for our purposes, began with Alexander Breckinridge who had moved to Philadelphia around 1728, eventually relocating to the colony of Virginia. Members of the Breckinridge family were prominent as ministers and theologians and church leaders and politicians in nation and state, and soldiers and businessmen and women, and more often than not, they were Presbyterians in conviction and practice. Today, on the date of his birthday, November 3, 1828, we focus in on Samuel Miller Breckinridge. Son of John Breckinridge, who was a Presbyterian minister, young Samuel had as his mother that of Margaret Miller, the daughter of the Rev. Samuel Miller, yes, that Samuel Miller, who was an early professor of the Princeton Theological Seminary. So it is no wonder that her maiden name became his middle name, as in Samuel Miller Breckinridge. Samuel was educated at Union College, New York and Centre College, Kentucky, and finally at the College of New Jersey at Princeton, New Jersey [later renamed Princeton University in 1896]. He completed his studies at the graduate law school at Transylvania University at Lexington Kentucky. Settling in St. Louis, Missouri, he represented the city and county in the Missouri Legislature for one year in 1854 – 55. He continued to move up in important positions in the state as he was elected the judge of Circuit Court in 1863. In the same year, he was chosen a member of the State Convention. We might be tempted to think that he only had an influence in political matters, but his membership in the Second Presbyterian Church in St. Louis, Missouri was recognized when that local church elected him to serve as a ruling elder in 1871. Three years later, he served as a commissioner to the General Assembly of the Presbyterian Church when it met in the city. He became a member of the Committee of Fraternal Relations, and was appointed to try and meet with the elders in the Presbyterian Church in the United States, formerly the Presbyterian Church of the Confederacy. His church position continued to give him opportunities within that denomination as he was a member of the General Assembly’s Committee on Revision of the Book of Discipline in 1878, and he continued to serve as a commissioner at the General Assembly as it met in 1881 and 1883. A description of him was that he was a model Christian gentleman, wise in counsel, with a marked influence in ecclesiastical matters. 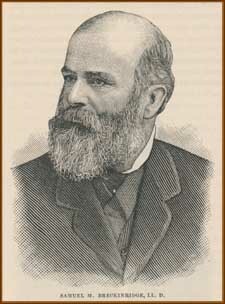 He died in 1891. May it be said of all of us that we either are having or will have a marked influence in ecclesiastical matters. Your local church may indeed need that at this time in her history. As the post Christian century continues in our land, we will certainly need that characteristic more and more in the local and national areas. Pray for it if you don’t have it now, or pray for an increase of that character. The Holy Spirit will bless you in it, and give you many opportunities to use it in the days in which we live. Image source: Page 97 in the Encyclopædia of the Presbyterian Church in the United States of America, including the Northern and Southern Assemblies, by Alfred Nevin. Philadelphia: Presbyterian Encyclopedia Publishing Co., 1884.